Aaron Brooks’ speed and finishing ability caught the Rockets’ attention during his pre-draft workout. Houston – 12 prospects. 2 days. An infinite number of possibilities. That’s the vibe permeating Toyota Center right now after the Rockets sent a dozen draft eligible prospects through their paces Monday and Tuesday. 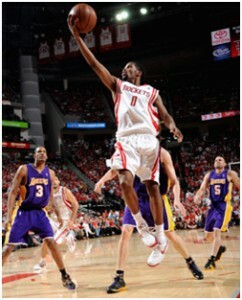 The team is keeping its cards carefully hidden, so don’t even ask for the players’ names – the Rockets aren’t sharing. Knowledge is power and Houston’s brain trust has no desire to divulge even the tiniest of secrets which might tip their hand in any way. That there would be such mystery and intrigue seems appropriate given the draft position the Rockets currently occupy; which is to say, they don’t – not in the traditional sense, anyway. With selection day approximately two weeks away, Houston is preparing for a draft in which it owns exactly zero picks, putting the Rockets in the perhaps enviable position of a lurker at a garage sale, free to examine all the possibilities until they find a deal upon which they want to pounce. Indeed, the rumors involving the Rockets have already started flying. Tuesday morning a report surfaced saying Houston had “approached” Memphis to express its interest in possibly obtaining the No. 2 pick in this year’s draft. Such wild speculation is commonplace this time of the year and there’s no denying the fact 99 percent of these rumors end up being much ado about nothing. But reports like those do serve to illustrate the anything-is-possible nature of this draft from Houston’s standpoint. The Rockets have been up front from the beginning about their desire to buy a pick on June 25th and the most likely scenario still involves them doing so either late in the first round or at some point in the second. But… the club has also stated its intent to be opportunistic, so if something bigger happens to come along, Houston will be ready. All of which brings us back to this week’s workouts. Knowing that a plethora of potential scenarios could come knocking at the door over the course of the coming weeks, the Rockets know they must do their due diligence in order to ensure they’re ready for absolutely anything. So they invite players in – bigs and smalls, well-known and unknown – to get a closer look. It’s the same process the team has undertaken around the world – be it Chicago, Illinois for the NBA’s official pre-draft camp or Treviso, Italy for the Reebok Eurocamp –in an effort to make sure no stone, or diamond in the rough if you will, is left unturned. “We put players in situations where we can evaluate whether or not what they do translates,” says Rosas. “With point guards – can they play pick-and-roll in some of our offensive sets? Can they defend and operate in some of our defensive schemes? With wings – how are they getting their shots? Can they come off screens? What position are they most comfortable defending? And bigs – evaluating offensively and defensively what their technique and fundamentals are like in the post. Also important is the effort and competitiveness displayed by the players involved. A classic example of this came at the tail end of Tuesday’s intense two-hour workout, when the Rockets were putting the bigs through their “Superman” drill – a grueling, repetitive dunking exercise designed to test each player’s athleticism, endurance and ability to push through the pain and exhaustion. Just to repeat: This is a drill the Rockets typically only run with the big men on hand. But after having heard the top score on record, one of the wings boldly declared he could top it and the assembled coaches and staff were only too happy to let him try. Sixty seconds later, the record still stood but that sort of competitiveness and confidence catches one’s attention; which is exactly what this process is all about. “We want to see what kind of kids they are,” says Rosas. “How they take instruction, how competitive they are and how much they care about winning and losing. Can they be a good teammate? Do they have any natural leadership abilities? There’s a lot that we get from it. There’s nothing like being on the floor with these guys as they go through the drills. You can sit on the side and get a sense for what they can and can’t do, but getting on the floor with them on the floor and running them through drills, the feedback you obtain is invaluable. “We try to get as much as we can from the process but we realize not every player coming through here is going to ace the process. We’ve had some players, who have come in and struggled, but they show enough fundamentally and in technique that you see there’s something there, an indicator that this is someone who could be a diamond in the rough you should continue to track. These workouts are not the end-all and be-all of player evaluation, of course. It’s only one piece of the puzzle with the player’s body of work either overseas or in college serving as the most significant piece by far. But just as in any job interview, there’s nothing quite like wowing your would-be employer in a face-to-face setting which is something recent Rockets’ draft choices have taken advantage of in the past. “We come into these workouts specifically targeting players and specifically targeting points of emphasis to analyze them,” Rosas says. “But I will tell you: It’s the prospect’s total body of work that gets them here. It’s been refreshing that you do the work as a staff and you bring them in for a workout and they confirm a lot of your thoughts in terms of the strengths and weaknesses in their game. A guy like Aaron Brooks, he had a very competitive workout with us. Seeing his speed firsthand in a workout with us was special. His ability to finish and shoot, we’d seen it in games and we’d done our homework, but it’s still nice to get into a scenario like a workout where you can see just how special it is and how he uses it to his advantage. “Maarty Leunen was another guy who had a little bit more game than he showed at the college level – it wasn’t the team’s fault, it was just he played with a lot of good talent – but we felt like more of his game translated to the next level. He’s a guy who’s had a solid year in Europe because he’s a big who can pick-and-pop, shoot and defends and rebounds better than you would think. He needs experience and that’s why he’s in Europe, but he’s a guy who we liked and to get him in a situation where you can confirm some of those strengths and weaknesses in his game is key. That’s the process the Rockets are sorting through right now after spending the last year scouring the globe and digesting countless hours of tape. The fruits of their labor are about to be revealed though no one, not even upper management, knows what the end result will be. Still, you get the feeling the Rockets are feeling right at home in their current position. “We’ve got a lot of flexibility with our roster,” says Rosas. “And, in terms of being out of the draft at this point, we’ve evaluated a large pool just to be thorough and look to see what might be high value opportunities at certain points in the draft. We’ve got a great owner who gives us the resources to do our job and a General Manager who believes in the draft and a coach who’s very open to playing and developing young players, which isn’t always the case. As scouts, you can’t ask for anything better – you’ve got a reason to do your job and you’ve got people supporting you. Our work is not in vain.